The city government’s preparation is in full swing as a series of major celebrations approaches including the 114th Independence Day Celebration on June 12, the 62nd Charter Day Anniversary of the City of Cagayan de Oro on June 15, and the 151st Birth Anniversary of the National Hero Gat Jose Rizal on June 19. This developed after City Mayor Vicente “Dongkoy” Y. Emano recently organized a special task force, in which he appointed Councilor Adrian Barba as Chairman, specifically for the purpose of planning and implementing a sequence of activities in accordance with the aforementioned celebrations. Liga ng mga Barangay President and Councilor Dometilo Acenas is the appointed Vice Chairman while Councilor Alexander Dacer, City Administrator Atty. Leon Du M. Gan, Jr., City Accountant Wilma Rugay, City Planning and Development Coordinator Engr. Isidro Borja, OIC City Treasurer Juliete Glenda Valmorida, SK Federation President Sunshine Mae Obsioma, Acting City Information Officer Cheryl Moncay, Public Employment Services Office Manager Juvy Paza, and City Schools Division Superintendent Dr. Myrna Castaños are its members. Raffling for the relocation of typhoon Sendong survivors into their permanent homes is now being held weekly. This information comes from the office of Councilor Alexander Dacer, Chairman of the Committee of the Urban Poor, which he relayed to the Estate Management Division (EMD). Come May 30, 2012, the office of the EMD is scheduled to raffle off 50 houses in Indahag to beneficiaries presently living in the temporary shelters in Mandumol, Macasandig, Cagayan de Oro City. Also, on May 31, another raffling is to be undertaken in Tent City 2 in Calaanan for the relocation of its occupants to their permanent homes in the same barangay. A week earlier, around 300 families in Tibasak, Macasandig took part in a raffling for homes in the Indahag relocation site. Ms. Nena Padla, officer in charge of the Estate Management Division (EMD) informs that relocation houses shall be raffled for not less than 50 families each week. City Mayor Vicente “Dongkoy” Y. Emano is urging everyone to display the national flag as a symbol of unity of the Filipino people in consonance with the celebration of the 114th Independence Day Anniversary of the Philippines. In accord with the National Flag Day on May 28, Mayor Emano requests all national agency chiefs; owners of business establishments; barangay captains; presidents of Universities, colleges or schools; leaders of civic groups and organizations; and the department heads of City Hall to display the national flag until June 12, 2012. Mayor Emano also called on all officials of barangays located especially in the central part of the city to prominently display a minimum of 10 flags along the city streets during the course of the celebration. Officers of the ‘Association of Former Cagayan de Oro Police’ led by Capt. 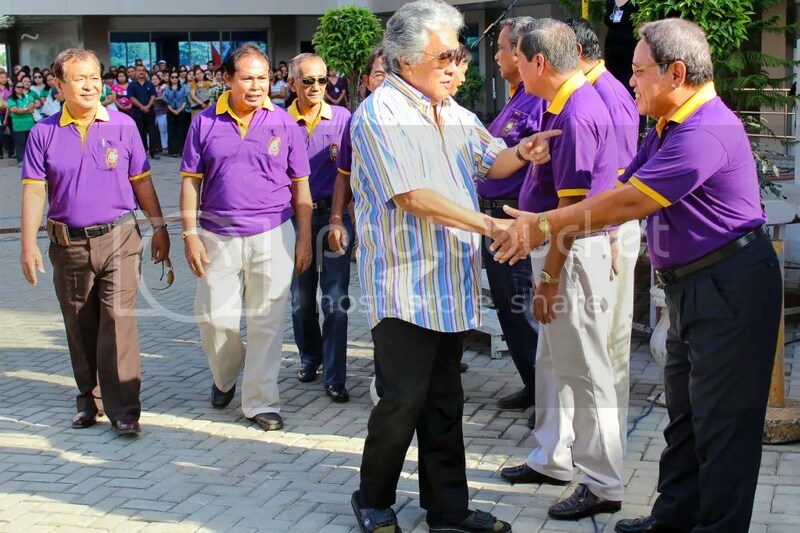 Douglas Dabatian (2nd from left) take their oath before City Mayor Vicente “Dongkoy” Y. Emano during the flag raising ceremony at the City Hall grounds where the mayor surprised the group with a spontaneous gift of P100T to help start their organization with. The mayor, knowing that these police officers served even way before his earliest term in office at the city hall, thanked the group for their selfless service to the city. This is an order he issued to all department heads in line with his desire to improve even more the delivery of service to the people of the city. Thus, only liaison officers with official business with other departments are allowed to enter and be seen within the premises of other departments/offices. “Gidid-an gayud ang mga kawani nga mag-suroy-suroy sa ubang buhatan sa oras ting-trabaho, gawas lang sa ma liaison officers ug kon opisyal ang tuyo sa usa ka opisina,” the Mayor clarified. 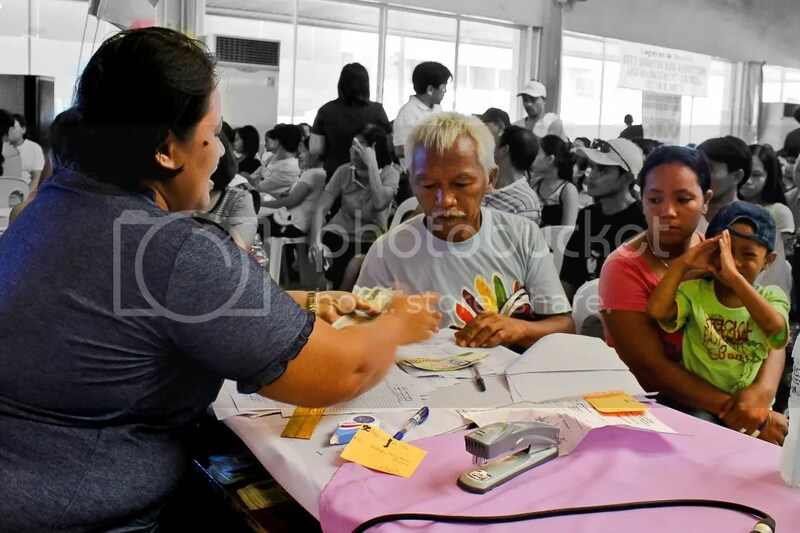 This family is one among the 3,286 beneficiaries who received their share of the cash aid distributed by the local government to those who were affected by the typhoon Sendong. The funds for this aid came from the city’s 5% Calamity Fund. The mayor announced that this is the last phase of the financial distribution. 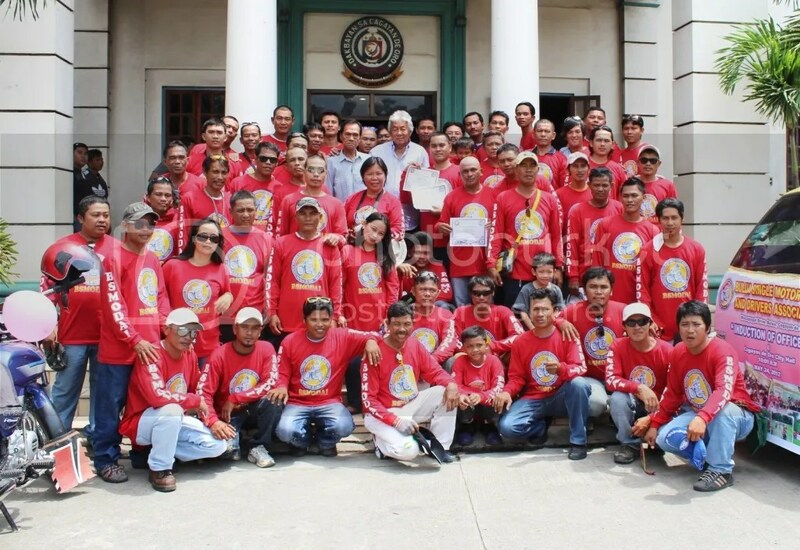 The new set of officers of the Bulua Single Motor Operators and Drivers Association, Inc., (BSMODAI) led by Barangay Bulua Councilor Pedro Legazpi (standing to the right of Mayor Emano) pose in front of the City Hall with City Mayor Vicente “Dongkoy” Y. Emano after they took their oath of office before the Mayor. In line with the preparations being undertaken for the Kagaya-an festivities this coming August, City Mayor Vicente Y. Emano has set up a committee tasked for this particular purpose. In accordance with Executive Order 047-2012, City Mayor Vicente Y. Emano appointed Vice Mayor Caesar Ian E. Acenas as Chairman of the 2012 City Fiesta Executive Committee, and City Councilor Ian Mark Q. Nacaya as Vice Chairman. The members of the aforementioned committee are: Kagawad Alexander S. Dacer, Emmanuel D. Abejuela, Simeon V. Licayan, Annie Y. Daba, Alden D. Bacal, Adrian L. Barba, Dometilo C. Acenas, Jr., City Administrator Atty. Leon Du M. Gan, City Engineer-Designate Engr. Mario V. Batar, City Treasurer-In-Charge Juliete Glenda E. Valmorida, OIC City Tourism Officer Imma Rae D. Gatuslao, OIC City Information Officer Cheryl C. Moncay, City Tourism Board Chairman Rhia Rita Y. Abalos, and Oro Chamber President Ma. Theresa Alegrio. Meanwhile, City Accountant Wilma Polley-Rugay was appointed as Program Director, with the staff of the City Council as Secretariat. Three thousand two hundred eighty-six (3,286) beneficiaries consisting of sharers and renters are scheduled to receive their share of cash aid totaling P7,231,059.00 from the city government in its last phase of financial distribution to Sendong survivors on Thursday, May 24, 2012, at the City Tourism Hall. This, according to City Mayor Vicente “Dongkoy” Y. Emano, who, as usual will be there to personally oversee the distribution. The mayor further added that the barangays included in this distribution are Zone 2, 3, 4, 5, 7 & Macanhan in Carmen; Barangay 13; Barangay 15; Barangay 17; Barangay 18; Kauswagan; Bulua; Iponan; Bonbon; Canitoan; Puntod; and Carinugan, Gold City, Emily Homes, Bacal/Galope/Caballero Compound, Villa Angela and Ilaya Centro in Balulang. Permanent housing units will be raffled off on Friday, May 25, to beneficiaries who will be relocated in Indahag, this city. This was announced by Nila A. Padla, officer-in-charge of the Estate Management Division (EMD). The beneficiaries assigned for relocation in Indahag are those typhoon Sendong survivors who are temporary billeted presently in the Tibasak Covered Court in Barangay Macasandig. Two hundred fifty (250) houses built by the Habitat For Humanity within the local government-owned land is reported to have already been completed. Thus, Mayor Emano estimated that the beneficiaries may be able to occupy their assigned permanent houses in Indahag by the end of this month. The EMD, which has undertaken previous raffling in the other relocation sites in the city, shall undertake this scheduled raffling.